This was one of the coolest, but weirdest challenges I have seen. Tara over at Should You Eat That? came up with a monthly challenge of pairing unusual ingredients together in any type of dish that we like. 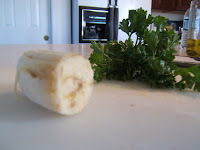 So when she announced that the ingredients were bananas and parsley I kind of scratched my head for a minute. My first thought was to do something on the sweet side, but then I started to think about it, and I decided that my family would be more willing to try something that was more on the savory dinner side, seeing as how I might be able to mask the banana a little bit. 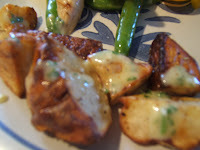 So here is my masterpiece --- Banana, Parsley Aioli drizzled over roasted baby potatoes!!! 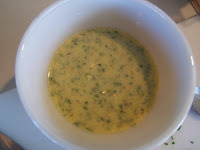 And OH MY GOD was this good, this was once of the best sauces/dishes I've ever made. I thought ketchup and roasted potatoes were good, but nope...this is the new Ketchup. It took a little trial and error for me to get the flavors right, but my family was so amazed when I told them. They said that the sauce was the best part of the whole dinner. And the great thing about (now that I know what to put in it) is that it's so simply to make. The sauce was a little tangy but very creamy, with a slight garlic bite to it. 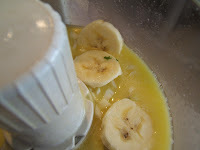 Without knowing there was banana in it you would definitely be able to sense a tiny sweetness to the sauce, but as soon as I told my family about the banana they were like "Oh so that's what it is, I knew I was tasting something different". I made sure not to tell them what was in it until after they ate it because I wanted to get their honest opinion about it, and I was surprised to hear rave reviews. 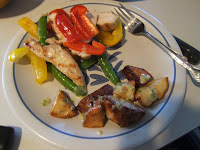 My mom even said this was the best part of the whole Lemon Grilled Chicken with Bell Peppers, Snap Pea Salad and Roasted Baby Potato Dinner. 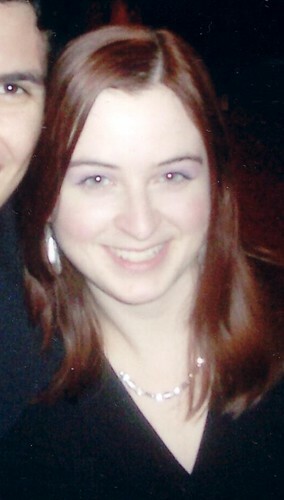 So thanks Tara for giving me the idea to create something I will be proud to make again and again. 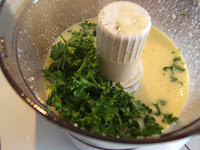 For the base of the recipe I used a basic Aioli recipe which I found from the Williams Sonoma website and added half a banana, a handful of chopped parsley, 1 tablespoon sugar, 1 tablespoon lemon zest and Dijon mustard. (Sorry that I don't have a recipe to post, but I didn't really write it down, I just kept adding and tasting!!) But this will definitely be a new staple in my cooking arsenal. And how fun was it to look at these ingredients and try to find a way to make them work! I can't wait for the next challenge, so Tara bring it on!! What a great idea! 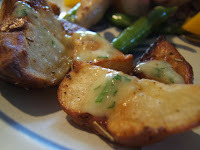 I love potatoes and I'm always looking for new ways to serve them. These look delicious, if I wasn't all parsley & banana-d out I would try these tonight... but I will definitely be trying them in the near future. I can't take the credit for coming up with this concept though (as much as I would like to), the TGRWT concept was thought up my Martin, and we will be choosing someone new to host the next challenge, so keep you eyes peeled... Thanks for participating!! Thank you so much!! Let me know what you think of it when you get a chance to try it!